Nikon today announced in a press release that they are suing Sakar—who makes and markets Polaroid cameras amongst a number of other branded products—in the US for infringement of design patent. The critical things in that sentence are "in the US" and "design patent." The Polaroid camera in question—again, to be made by Sakar and sold under the Polaroid name—is the iM1836, which was announced at CES early this year. It's a faux m4/3 Android-based camera for US$299, so when push comes to shove, the "design patent" Nikon apparently is suing over is the body case. As in plain, rounded sides, offset lens mount, made of metal. Your basic "bar of soap" design. Note, for instance, the way the camera strap hangers are the same on those two bodies. What it appears to me is that Sakar got molds from the same company that makes the Nikon J1 body molds. Given that Sakar will produce the product in China and that "mold stealing" is highly common in China, this isn't particularly surprising. This stealing problem has been around for decades, and if you don't manage the problem up front you'll eventually fall prey to it. I suspect Nikon's real problem is with a supplier. Moreover, Nikon will have the same problem Apple had with their "rounded corners on a tablet" suits against Samsung: box with soft corners is a fundamental type of design, not something terribly unique. I should point out that, as far as know, the camera in question hasn't actually hit the market, though it is shown on Sakar's own Web site. Thus Nikon's suit is an attempt to prevent Sakar from making the product. Update: the product began active shipping at the end of October via Amazon and Walmart. It's probably that latter distribution point that bothers Nikon the most, as side-by-side Nikon 1 and Polaroid displays would make it look like the Polaroid was a less expensive version of the Nikon 1. 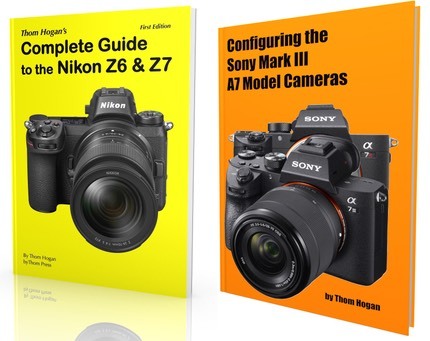 Ironically, Nikon has themselves moved three of the subsequent Nikon 1 models away from the thing they're suing over. Both the V2 and the AW1 are clearly different body styles. The S1 mimics the design in question, but has additional curves to it. 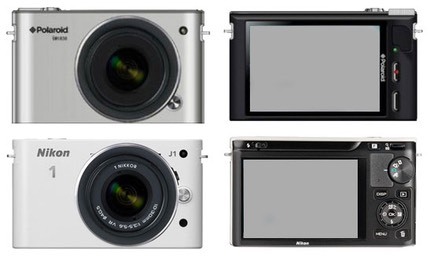 Only the J1/2/3 have the body design that Nikon suing over. Update Dec 6: a preliminary injunction now bars Sakar from manufacturing, importing, advertising, promoting, or offering the iM1836 for sale in its present configuration.